highly experienced make up artists will travel to your location servicing all areas around Australia. The Bella Pelle Team is guided by Carly Knowles, our head make-up artist, who is a Melbourne trained make-up artist with over 11 years experience working in the Fashion, Advertising, Bridal, Formal, TV & Media industries. Bella Pelle offers make up and hair styling services for all occasions from bridal and personal appointments to Editorial, Corporate functions, demonstrations, workshops, Fashion, Advertising, TV & Media. Make-up services are provided at both of our fully equipped clinics in our Bella Pelle Make Up Bar, or freelancing on location by our highly qualified and professional team. Bella Pelle, Yarrawonga, also has its very own team of Hair Styling professionals offering the ultimate hair pampering experience. Your highly trained stylists can offer advice on the latest trends, listening to your needs creating a unique style tailored specifically to your personality and delivering the look you want! Hair styling, including cuts, colours, advanced smoothing treatments etc, and is also available in either the clinic’s Hair Bar or freelancing on location. All services are by appointment only and will be accurately quoted individually and travel fees may be applied. 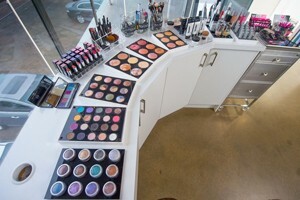 Whether it’s bridal makeup for your special day, photographic makeup for a creative shoot, editorial makeup, or just to look great for a special occasion, Our make up and styling team has the creative experience to enhance your natural beauty and give you a truly unique look.